Born in Rotterdam, Holland. Stage name of Abraham "Bram" Pieter Adrianus Bongers. Inspired as child. Aka "Mystica" at start of career until December 1950 when he became "Fred Kaps". Student of Henk Vermeyden. Top-line pro close-up and stage magician. FISM Grand Prix 1950 (as "Mystica"), 1955, 1961, making him the only 3-time winner of magic's most prestigious competition award. Toured all Europe in 1955 and USA in 1956. Called "World's Greatest Magician" in 1972 by George Anderson, a widely shared opinion. 1980 AMA Masters Fellowship. SAM Hall of Fame. Died of cancer. Il gioco delle 11 carte di Edward Victor eseguito con delle banconote da un dollaro. Sixteen moves and card bits by Fred Kaps on video and also explained briefly in text. Similar product from Fred Kaps but on coins is: Kaps on Coins . From a manuscript written by Fred Kaps. The descriptions are almost entirely Fred Kaps' own, taken from the manuscripts in his handwriting. Changes of words or grammar have only been made where the meaning could have been in doubt had Fred's terminology been used. Fred Kaps' Purse uses techniques by Fred Kaps, fully explained and illustrated with original photographs. This is one of my pet effects that I practically always carry with me because I can do the routine anytime, anywhere, without any set-up. Edward Victor's 11 Card Trick done with Dollar Bills. The details and inner working of this routine have been kept secret since the days of Fred Kaps; before then it was only divulged to a handful of very close friends, and occasionally discussed by Fred Kaps with serious performers. Subsequently the original routine has been independently developed, changed and adapted by Trevor Lewis, Mike Caveney, Peter Pit, Ger Copper and other well-known performers to suit their own individual styles. As taught by Fred Kaps to Trevor Lewis. The warm, bright Mediterranean sunshine and Phillipe Fialho's delightful villa looking down on Nice in the French Riviera was the setting for Fred Kaps to teach Trevor Lewis his Cups and Balls routine and generously tell Trevor he could do what he liked with it. Trevor had a video of Fred performing the routine and had written it up in rough notes. 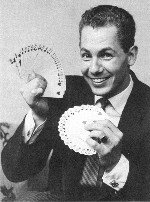 Back in 1965 Fred Kaps gave a landmark lecture at the Magic Circle and now this lecture is available as MP3 download including a PDF which is a transcription of the lecture with additional illustrations. Bearing in mind Fred Kaps' reputation, it is strange that so little has been written about the man and his methods. Just the first ten minutes of this recording holds a fundamentally important lesson every serious student of magic needs to know.